Final results from Sweden's parliamentary election Sunday are expected later in the week, but preliminary results have one of Europe's most liberal nations making a turn to the right and wondering how it will form a government. The anti-immigration Sweden Democrats that wants the country to leave the European Union and impose a freeze on immigration, appears poised to become the third largest party in parliament. With most ballots counted, the ruling center-left Social Democrats have 28 percent of the vote, trailed by the Moderates with 19 percent and the nationalist Sweden Democrats with almost 18 percent. The Social Democrats and the Moderates have said they will not consider the Sweden Democrats, a party with roots in the neo-Nazi fringe, as a coalition partner. The Moderates say they will form a coalition government and have called on Prime Minister Stefan Lofven, a Social Democrat, to step down. Lofven said the election presented "a situation that all responsible parties must deal with," and added that "a party with roots in Nazis" would "never ever offer anything responsible, but hatred." 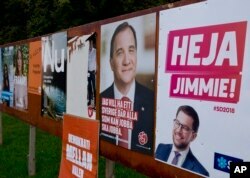 This photo shows an election poster or Jimmie Akesson, right, leader of the far-right Sweden Democrats, and Social Democratic Prime Minister Stefan Lofven, second from right. in Flen, Sweden, Aug. 30, 2018. Ahead of the election, Lofven had warned, "The haters are mobilizing in Sweden and are egging on people against people. ... We will resist. We will stand up for equality." Pollsters had warned that the far-right Sweden Democrats could end up winning veto power over which parties form the next government. Magnus Blomgren a social scientist at Umea University, said, "Traditional parties have failed to respond to the sense of discontent that exists."